Uber has now notched up five years in Australia and there’s no sign the mobile ride-hailing app’s growth will slow down anytime soon. Nearly 3.7 million Australians 14+ (18.4 per cent of the population) travelled by Uber in the last three months – up from just under 1 million (5.1 per cent) less than 2 years ago. This is according to study by Roy Morgan Research conducted over the last six months, which found Uber is well positioned to ward of rising competition. The research also showed that compared to two years ago, Uber is now a phenomenon for all ages. The strongest percentage growth since 2015 has been among age groups 35 and over, although all age groups have experienced significant growth. 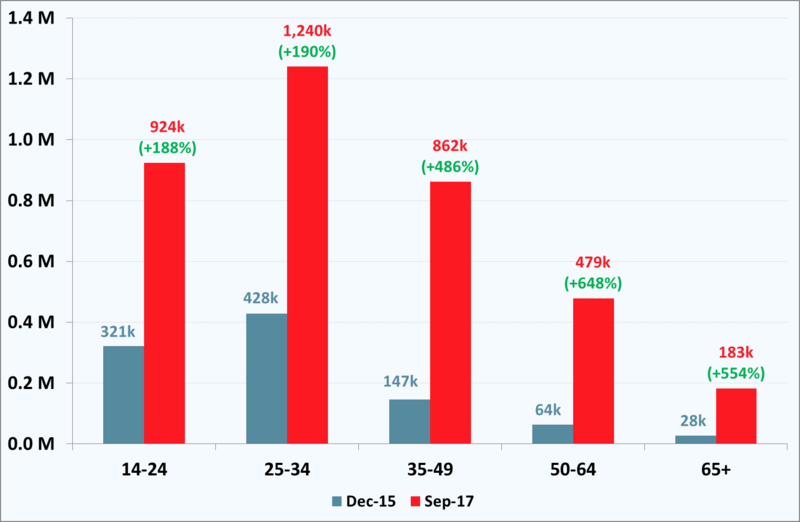 Despite the growth of older Uber users, a clear majority of 58.7 per cent of users are still aged under 35, either 14-24 (25.1 per cent) or 25-34 (33.6 per cent) with a further 23.4 per cent aged 35-49 and 17.9 per cent aged 50 plus. These proportions represent a significant percentage change from 2015 when over three-quarters of Uber travellers were aged under 35. Source: Roy Morgan Single Source (Australia), July-December 2015, n=7,427 and April-September 2017, n= 8,030. Base: Australians 14+. One interesting change from two years ago as Uber has become more widely used is that in 2017 clearly more Australians have traveled by Uber (3.7 million) than the 3.25 million Australians (or 16.2 per cent) that have ever downloaded the Uber app. In 2015 these figures were reversed: (5.2 per cent had downloaded the app cf. 5.0 per cent had ever travelled by Uber). The rising number of Australians travelling by Uber without ever downloading the app is an example of ‘network effects’ as more people download the app, it’s more likely than when out with friends, family member or a partner that someone is able to utilise the service through others without ever actually downloading the app themselves. Of course the industry with most to fear from Uber as demonstrated by several high-profile protests in recent years is Australia’s state-based taxi services. The growth of Uber, and entry of new ride-hailing apps, has had a definite impact on the level of taxi patronage around Australia. Once again, as it was revealed two years ago in ‘Uber phenomenon’, it is Western Australia that leads the nation in Uber adoption. W.A is the only state in which more residents have travelled by Uber in the last three months (23.9 per cent) than via a taxi (19.6 per cent) – also the lowest rate of taxi patronage in the nation. The precocious rates of adoption in WA is followed closely by Victoria (21.8 per cent), NSW (17.4 per cent) and QLD (17 per cent). 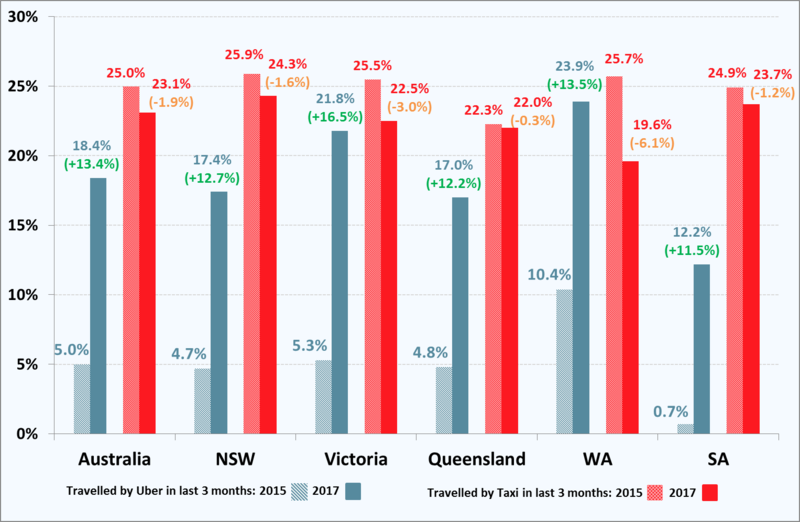 South Australia has come off a very low base in 2015 with Uber finally accredited just over six months ago while Uber usage in Tasmania is still well below the mainland States after entering the island State under a year ago. Michele Levine, CEO, Roy Morgan, said the incredible success of the Uber mobile ride-hailing app is finally attracting competitors to the field as the market matures. Although Uber entered the Australian market late in 2012, the service was only extended to Tasmania less than a year ago and only accredited in South Australia in April 2017. The success of Uber in Western Australia is particularly instructive for traditional taxi driving industries around Australia with 23.9 per cent of West Australians reporting they’ve travelled by Uber in the last three months compared to only 19.6 per cent that have used a taxi. According to Levine, even though taxis are still preferred in all other States the trends revealed over the past two years suggest this is likely to change in the near future. Although usage of Uber still skews younger (nearly 60 per cent of Uber travellers are aged under 35), this is down significantly from 2015 when over three-quarters of Uber travellers were aged under 35. The growth in the Uber market is coming across all age groups but as the app finds more widespread appeal older age groups are increasingly recognising the value and savings available via the service. Taxify, which claims over 4 million customers in 20 countries worldwide, is vowing to cut costs for consumers and appeal to drivers by offering a larger cut of each fare.